Musicians as Researchers - Insight or Insanity? In the current university context, many highly-proficient music performers enrol in higher education degrees by research. While at first glance those enrolled may seem to be moving from an area of expertise to an area of inexperience, in many cases the individual may in fact have already developed a range of research skills in the course of becoming highly proficient in their chosen field. Many expert musicians seek to further develop their craft through embarking on research degrees and/or seek inspiration through what they aim to discover. Research is a highly valued skill among many musicians pursuing fine music making. 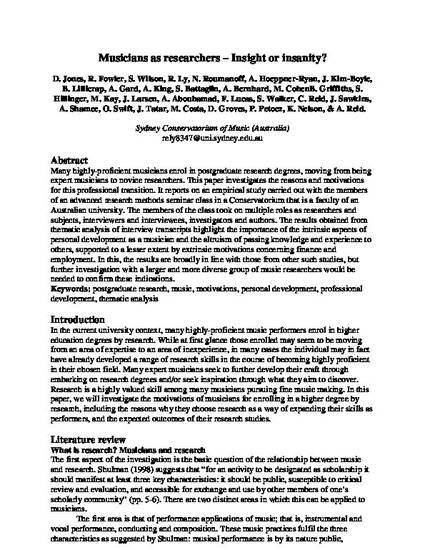 In this paper, we will investigate the motivations of musicians for enrolling in a higher degree by research, including the reasons why they choose research as a way of expanding their skills as performers, and the expected outcomes of their research studies. This conference paper may be accessed from the publisher here.